Thanksgiving can be a difficult time for anyone on a diet. The abundance of complex carbohydrates, the sugary desserts, and all of the alcohol your family might drink — a Thanksgiving meal can be an entire day’s worth of calories. While it’s only a meal that takes place once a year, there are some people who, if they go off their diet for even one meal, they won’t be able to get back on it. With the fresh food from Joseph’s Classic Market, we have ingredients that are perfect to put in diet-friendly desserts. Instead of consuming 1000 calories on dessert alone with a slice of pecan pie, try out some of these fresh dessert recipes. If you’re not much of a cook or a baker and you have to make the Thanksgiving dinner, then we have some great alternatives. If you have to bring pies, then check out our bakery section and if you need an entire meal, then order a Thanksgiving dinner. If you’re on a diet, then don’t fear the Thanksgiving meal nor the dessert. In Spice Up Your Thanksgiving Dinner With Some Different Dishes, we went over some delicious options you can make to add some versatility to your Thanksgiving meal. In today’s blog, we’ll be going over some options for your dessert. 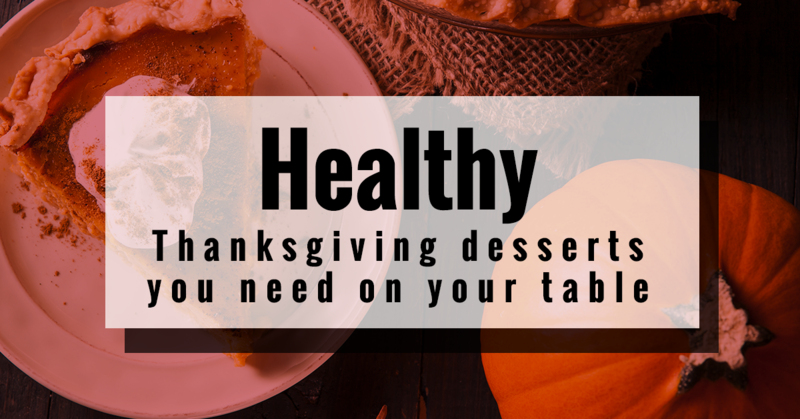 Even if you decide to purchase our Thanksgiving dinner, keep in mind that you can always add some dessert that’s healthy with fresh ingredients. Regardless if you need a Thanksgiving dinner or just some fresh food for your recipes, Joseph’s Classic Market has you covered this holiday season. The first option is an apple crumble pie. First of all, this is a vegan dessert option. If you have some vegan relatives or you’re trying to eat more clean, then this option is perfect. The apple crumble pie blends two delicious desserts and turns it healthier by only using vegan ingredients. You’ll have the best of both worlds with an apple pie and an apple crisp in this dessert. What’s even better about this dessert is that it’s very easy to make. You’ll need raw almonds, rolled oats, white whole-wheat flour, unsweetened coconut, coconut oil, maple syrup, apples, sugar, ground cinnamon, nutmeg, and Earth Balance. Find the whole recipe here. Here’s another great vegan option for your dessert table. You can either make this in small containers for individuals or you can make it in a large bowl and people can spoon out this delicious confection. This pudding isn’t as sweet as you might think, which is good when you’re on a diet. In addition, it’s filled with protein and fiber, so you don’t have to worry about feeling guilty while eating it. This dessert is made from avocado, canned pumpkin, silken tofu, dates, maple syrup, pumpkin pie spice, and sea salt. For the full recipe, click here. If you love cheesecake, then these pumpkin cheesecake bites will hit the spot. What makes these different is that it’s healthy and will hit the spot while still being healthy. You won’t feel guilty eating these and you won’t break your diet. In addition, the small bites are perfectly portioned, so you don’t have to worry about overeating. When you bake these bites, you’ll need a muffin pan, so they are very easy to make. However, because it is cheesecake you’ll need to make the crust, cheesecake layer, and the pumpkin swirl. To learn the whole recipe, click here. If you don’t want to serve anything with carbohydrates since your meal is already filled with them, then this special treat will be perfect for your Thanksgiving dessert. The caramel spiced apples are extremely easy to make and you don’t have to use any carbohydrates. For this recipe, you’ll need ground cinnamon, ground cloves, apples, apple cider, lemon juice, chopped pecans, and if you want to add a little bit of ice-cream then go ahead and get a little crazy. If you’re interested in trying this recipe, click here. Now that you are ready with desserts, it’s time to prepare your Thanksgiving meal! Have a Happy Thanksgiving and don’t forget to stop at Joseph’s Classic Market for your fresh ingredients.